How to use automated campaigns? How to format campaign messages? What are Email Campaigns recipient limits? 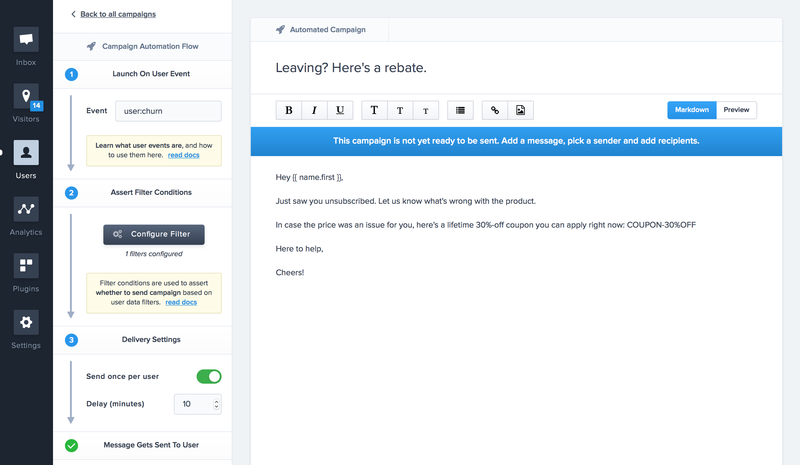 Automated campaigns are used to send emails to your users based on pre-defined event trigger filters. Write an email, schedule on which filter condition it should run for a given user, and activate it. This guide explains you how automated campaigns work and how to use them. Automated campaigns are pre-defined emails, that are sent on a per-user basis, based on given user events. Automated Campaigns can be used to automate your workflow and contact your users on some custom event from your website, service or app. There&apos;s no limit on how many automated campaigns you can run at the same time, and how many users can receive automated emails. The only requirement is that your app runs the Crisp chatbox when it needs to send a custom event. How an Automated Campaign is set to trigger? First, you need to create a new Automated Campaign. Go to app.crisp.chat and click on the User sidebar tab. Then, click on the Campaigns button on the top, and then New Campaign. A popup will open, prompting you to pick the campaign type. 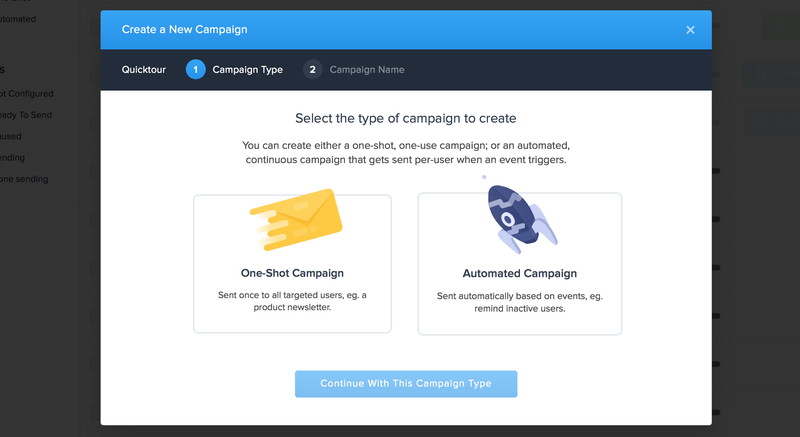 Select Automated Campaign, then name your campaign and continue. Once done, you&apos;re redirected to the campaign editor. On the campaign automation flow bar on the left, enter a campaign event name, which will be used to trigger your campaign (we explain how to use this event below). A good event name can be eg. user:churn, user:welcome, product_add_to_basket, etc. Now, it&apos;s time to specify some filters. Filters are not required, but can be useful if you still need to do some checks to ensure the campaign isn&apos;t sent to users who don&apos;t need to receive it. For instance, you may trigger an event when user logs in to your app eg. user:login, but you only want to send the Automated Campaign message to those who didn&apos;t come back since 1 week. Thus, you can specify a filter on user last active date and set it to greater than (7 days * 24 hours) = 168 hours. 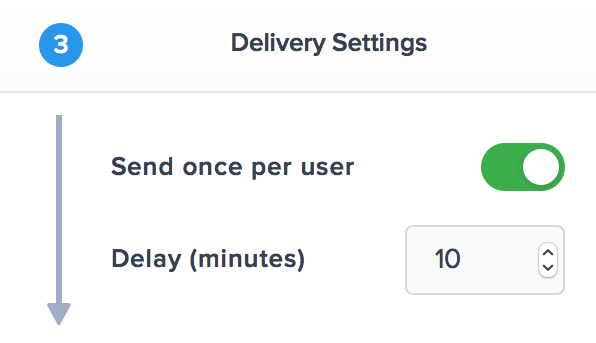 If needed, you can specify a delay in minutes, to wait for some time before sending the message to user, once event and filter pass. You can also ensure a message is not delivered twice or more for a given message (this helps avoid flooding the user with the same campaign message every day, eg. if you fire the campaign event every day for this user on your end). Finally, write your campaign message. Make sure to read our help article on How to format campaign messages?. Once you&apos;re ready, Save the campaign and then Activate it. Automated campaigns, whether through chat or email or both, require an email address to be set for the session. If no email is set, events will be stacked and un-stacked later on when an email is pushed. You can automatically push the logged in user email using $crisp.push(["set", "user:email", ["user@domain.com"]]), where the email would be injected from your backend while generating the page. Can I pause an Automated Campaign? Yes! Simply click on Deactivate to pause the Automated Campaign. You can enable it back at any time, by clicking on Activate. Which plan do I need to use Automated Campaigns? Automated Campaigns are part of the Unlimited plan. They come with no limit on how many automated campaigns can be sent, as the plan name suggests.